A dairy cow on a smallholder farm in Ol Kalou, near Nairobi, Kenya (photo credit: ILRI/Paul Karaimu). Should farm animals share our cityscapes with us? While policies are often based on the prejudice that urban livestock keeping is unsafe, scientific evidence shows that poor people continue to benefit more than be harmed by raising livestock in cities. Still, the whole story is complex, and while urban livestock keepers would help themselves, and their customers, by adopting a few basic safety precautions, the benefits to very poor people of keeping livestock even in crowded slums often appear to outweigh the harms, such as the diseases such ‘city cows’ can transmit to people.
. . . Farming has been increasing in many African cities . . . . Dairy cattle are not the most obvious domestic animals to share small and crowded city compounds, but the rewards—including improved food security, nutrition and health—are considerable. ‘In Nairobi, dairying is recognised as a widespread activity, which has led to concerns about livestock being a source of pollution and disease. Hazards undoubtedly exist: a study by the International Livestock Research Institute (ILRI) found that zoonoses (diseases transmitted between animals and humans) make up 26 per cent of the infectious disease burden in low-income countries, but only 0.7 per cent in high-income countries. But in the absence of evidence, policies are often based on the prejudice that urban livestock keeping is unsafe, and it is often banned outright. ‘In 2005, a study was initiated by the University of Nairobi and ILRI to understand the risks and benefits of urban dairying, in order to contribute to pro-poor policy and help create good practice guidelines for risk reduction. The study focused on a diarrhoeal disease, cryptosporidiosis, because of its prevalence in cattle and its status as an emerging disease that was of concern to decision-makers. As a parasite that is harboured in cattle but can affect people, especially the immune-suppressed, Cryptosporidium may be found in raw milk, manure, soil and water, and on vegetables and other foods, as well as other contaminated surfaces. ‘In Dagoretti, which lies 12 kilometres from Nairobi’s city centre, 1 in 80 households were found to keep cattle, with an average of three cattle per household. 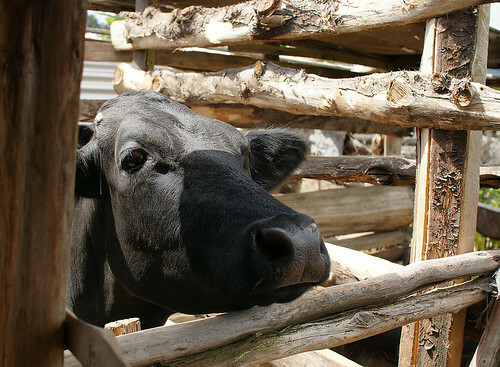 However, the study found that there was no difference between cattle-keeping and non-cattle keeping households in Cryptosporidium prevalence, no association between infection in cattle and in people in the same households, and that the prevalence of the parasite in people living with HIV was no higher than in the general community. ‘The disease risk posed by raising, processing and consuming livestock products in urban areas was revealed to be less than many people think. For example, most people, including food safety officials, thought that livestock-derived foods such as meat and milk carried the greatest risk of passing on diseases which are harboured by animals. But although dairy cattle are the reservoir of Cryptosporidium, consumption of raw vegetables was found to be more risky than consuming milk. This could be because untreated cattle manure is used as a fertiliser. . . . The relationship between livestock-keeping and health is complex, says ILRI’s Delia Grace, the principal investigator in the study. . . . [E]ven when cattle harbour diseases, the health of households that keep cattle may on the whole be better than those that don’t. Read the whole article in New Agriculturist: Livestock in the city: Separating fact from fiction, May 2013. Tags: Cryptosporidosis, Dagoretti, Delia Grace, New Agriculturist, University of Nairobi. Bookmark the permalink. I live and work in Burundi, where for many years we’ve been managing a small ruminant rehabilitation program. Certainly the keeping of livestock in the proximity of homes is practically universal,here, due to security and in the recent past, war and raids. This is certainly also the case in many other areas of Africa in which I have worked. Yes, the issue may be more complicated that may at first appear, but here I see another instance of (primarily) western notions of hygiene being imposed.- not that they are invalid, but may be out of place in particular circumstances. Here, the drinking of raw milk is a high cause of TB, and I would see this as far more a threat than whether the cow is kept in the backyard.